The softie Dog Muzzle is a temporary, reliable restraint, ideal for grooming, training and treating your dog. If dogs could talk, they'd ask for the Softie, because it is comfortable and allows them to pant and breathe. The Softie is made from patented Dupont fabric which is exceptionally resistant to abrasions, punctures and tears. This is an easy care, wash and wear product. Available in five sizes to fit most breeds. These soft muzzles are made from nylon side panels and a front fishnet plastic mesh section, which allows the dog to breathe easily while muzzled. The Softie muzzle has an adjustable back strap which is made to snap quickly behind the dog's head. The muzzle is washable and resistant to tears and punctures. Softie muzzles are created to be easily secured around dog muzzles with optimum comfort to the dog. The breed chart below is just a general guide. For Yorkies, Toy Poodles, Malteses, Cavalier Spaniels, Chihuauas & other Mini Minature Toy Breeds with similar size snouts. For Minature Poodles, Bichons, Frises, Minature Schnauzers, Shelties, Yorkies, Pekingese, Corgis & other Miniature Breeds with similar size snouts. For Small Beagles, Fox Terriers, Keeshounds, Whippets, Westies, Jack Russels, Standard Dachshunds, Standard Poodles, Lhasa Apsos and dogs with similar size snouts. For Border Collies, Large Beagles, Bull Terriers, Springers, Cocker Spaniel, Fox Terriers and dogs with similar size snouts. For German Shepherds, Rottweilers, Labs, Retrievers, Huskys, Dobermans, Wolfhounds, Setters and dogs with similar size snouts. For St. Bernards, Great Danes, Newfoundlands, Bull Mastiffs, Great Pyreness and dogs with similar size snouts. ** It is VERY important that you give your dog enough room to pant while wearing the muzzle. The measurements shown in the chart below are the ACTUAL measurements of the muzzle itself. You need to be sure of TWO things before you choose your muzzle size. FIRST: The muzzle cannot be longer than your dog’s actually “nose length”. If the muzzle is longer than your dog's nose length, the muzzle will be in the dog's line of vision. 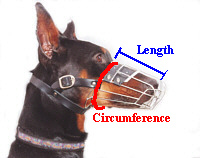 SECOND: The muzzle's "circumference" must be larger than your dog's nose circumference. We recommend 1 inch larger than your dog's measurement. If the muzzle is the exact same size as your dog's nose, the dog won't be able to pant. Its mouth won't even be able to open. 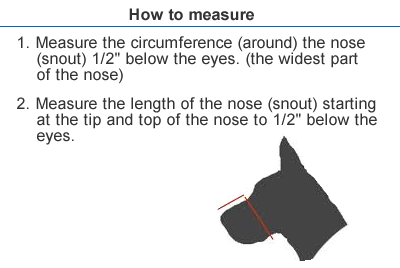 For correct fit, measure your dogs snout (nose) circumference (all the way around with the mouth closed) at the widest part, 1/2" below the eyes. Measure the nose length from the top & tip of the nose to 1/2" below the eyes. For smaller dogs add approximately 1/2 inch to the dogs snout circumference. For bigger dogs add approximately 1 inch to the dogs snout circumference. You want the dog muzzle to be bigger than your dogs snout circumference. If you are unsure of the size to choose, measure your dog then call our office and we will do our best to help you decide the best style and size of muzzle for your dog. You need measurement tape or some sort of string which you can place next to ruler. You need also pen and paper to write the measurements down on. Designed for midly aggressive dogs only. Practical usage recommended. Use only with direct supervision. Never leave your dog unattended. Using a muzzle for an extended period of time can interfere with your dog's natural cooling system.